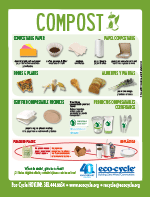 Backyard composting is the best way to compost your food scraps and yard debris. > How to get started...it's easier than you think! > What shouldn't go in compost? > Doesn't compost smell bad? > Where can I purchase a bin? > How can I learn more and what are Master Composter classes? Compost happens naturally, no matter what, but by following these directions you help to accelerate the natural decomposition process to produce healthy soil. Step 1: Obtain a bin or an area in your yard that is approximately one cubic yard (3'x3'x3'). Size is important for the proper temperature. Piles that are too small cannot hold enough heat for effective microbial activity, and piles too large (more than 5 feet cubed) do not allow for enough air to reach microbes in the center of the pile. Step 6: When it is ready your compost should look and smell like richsoil. Use finished compost to feed your garden, flowers, potted plants and lawn. Work in half an inch of mature compost into the top six inches of the soil with a garden fork or rototiller. Be sure that soil isn't sodden with water as this can result in an "adobe effect" when it dries which adversely affects the plants. Use compost as mulch to gradually improve the soil. Apply it an inch or so deep, between the plants. Use 20% mature compost in the soil mix (if the mix you purchased doesn't already contain compost or worm castings). Sprinkle 1/8 to 1/4 inch of fine compost evenly across the grass to improve the lawn's ability to use fertilizers more efficiently so that less is needed. If you do fertilize your lawn, consider using one of the natural products based on recycled dried poultry wastes (often listed as DPW on the ingredient list) rather than synthetic chemicals. Uncomposted wood chips, grass clippings, and leaves can be spread around plantings. Be sure that woody wastes are shredded or chipped up. Add small handfuls to the surface of the soil inside the pots. It will break down over time and provide nutrients as it decomposes. 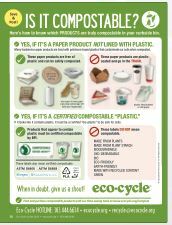 What shouldn't go in compost? 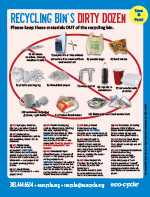 Bones, meat, eggs (egg shells are okay), cheese, and other dairy products or oils should be thrown in the garbage. Excrement from dogs and cats should also be kept out. No. Compost should not create an odor if you take care of it properly and don't overload the system. Always bury the food waste by pulling aside some of the bedding, dumping the waste, and then cover it up with the bedding again. Bury successive loads in different locations in the bin. Healthy compost smells like soil. If your compost is smelly, that's a sign that it needs more air. Aerate your compost by regularly turning your pile. Worms in a 16"x19"x12" bin can process 2-3 pounds of garbage a week. 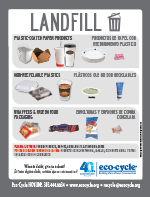 Capacity of a 20" x 24" x 12" bin is up to 5 pounds of garbage a week. The secret to compost does not lie in a commercial bin. Many composters simply wire off a 3'x3'x3' area, while others use pallets for bin walls. However, if you do want to use a commercial bin, please note that stores stock the widest availability of bins in the spring. Prices range from $30 to $200. The most common problem is unpleasant, strong odors which are caused by lack of oxygen in the compost due to overloading with food waste so that the food sits around too long, and the bin contents become too wet. The solution is to stop adding food waste until the worms and micro-organisms have broken down what food is in there, and to gently stir up the entire contents to allow more air in. Check the drainage holes to make sure they are not blocked. Drill more holes if necessary. Worms will drown if their surroundings become too wet. Worms have been known to crawl out of the bedding and onto the sides and lid if conditions are wrong for them. If the moisture level seems alright, the bedding may be too acidic. This can happen if you add a lot of citrus peels and other acidic foods. Adjust by adding a little garden lime and cutting down on acidic wastes. Add food scraps when they're fresh. Bury food scraps under bedding. Sprinkle calcium carbonate (lime from stone, not "quick lime") in the bin. Place a petri dish filled with vinegar in the bin or place the bin outside in subfreezing temperatures for a few hours (but don't let the worms freeze). If flies are still persistent, move the bin to a location where flies will not be bothersome. A few friendly spiders nearby will help control fly problems! Become a Master Composter by taking one of the extremely informative and thorough trainings provided by Boulder County Resource Conservation Division. Learn more from the county's website or by calling 720-564-2220. Several cities across the country operate curbside organics collection programs, and one of the best programs is in San Francisco. Q: I have a backyard compost bin. Is there something I should be doing to winterize my bin? A: Composting is a living process where microorganisms eat decaying matter (and each other). It can also involve macro-organisms like compost worms. Not being mammals, both kinds of critters move (and eat) progressively slower as their surroundings get colder. So composting inevitably slows down in backyard bins in the winter, but with a few simple practices, you can continue to put your food scraps in your bin right through the cold weather and have a jump on great soil for next spring. Keep it moist: Freezing and thawing dries out the top several inches of your pile. Before you empty your kitchen food scrap bin, run an inch or so of water into it, swirl it around for a moment, and then spread the contents over the top of your pile. This will replace some of that lost water and leave you with a cleaner bin – it’s actually a good practice year-round in our climate. Insulation can help: This isn’t necessarily practical for some tall, relatively skinny black plastic bins, but I’ve found that a foil-backed bubble insulation sheet available by the foot at McGuckins and likely elsewhere holds up for years and provides just enough insulation (and water retention) to keep things moving when layered on top of the pile. Use solar power: Spring is a better time to move your compost pile, but keep in mind that the best location for a backyard bin is underneath a deciduous tree. The shade will keep the pile cool in the summer, and the sun will help warm it in the winter after the leaves drop. Don’t be a stranger: The best advice I can give for any time of year is to pay attention to your compost pile. Every Colorado winter has a stretch of several weeks that may be just too cold and snowy to do anything but dump your scrap bin onto your pile and run back inside, but don’t just make that your habit until spring. Take a moment on those nice sunny days we always get to have a look – spread out those thawed chunks of food waste and add some extra water if the top looks dry. Q: Should I use compost in my garden now or in the spring or both? A: Fall is actually the ideal time to add compost to your garden; winter thaws are a great time as well. Compost straight out of the bin is never completely broken down, so incorporating it into your garden soil well before spring gives your soil microbes time to complete the work and ensures the nutrients will be available to your plants when they need them. You’ll have the added benefit of clearing enough space in your compost bin to accommodate all your winter food scraps despite the microbial slowdown. Q. I’m putting my garden to bed for the winter and am wondering about the best way to do that. Should I use leaves? How should I use fallen leaves or mulch over the winter? My neighbor uses burlap to cover his garden. Is that an important step? A. Yes, make use of your fallen leaves! There are several ways to do that, including piling them up and slowly adding them to your compost pile, but mulching your garden is a great idea. A six-inch layer of leaves on top of your beds keeps the moisture in your soil and the frost out. The challenge on the Front Range is keeping the wind from regularly re-distributing the leaves all over your yard, and that’s where the burlap sacks can come in handy – if you anchor them down with rocks or stakes, they’ll keep the leaves in place. If you have access to a chipper/shredder, another method is to grind all your leaves, spread them 2-3 inches thick on your beds, and settle them into place with water. They will crust over just enough to stay in place. With either method, often the leaves will be almost fully decomposed when you are ready to garden next spring. 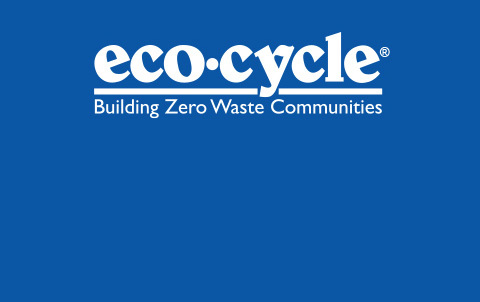 Dan Matsch is Eco-Cycle’s Compost and Organic Farming Expert. Before coming to Eco-Cycle, Dan was an organic farmer for 13 years and owned Gem o’the Field Organic Farm with his wife Carol. He sold produce, plants, and flowers at the Boulder Farmers’ Market and served on the Market’s board. Dan works hard to bring composting capabilities to Boulder County for businesses and residents, as well as provide opportunities for local farmers and growers to benefit from the compost products created.